While website architecture, link building, and template coding all affect search engine optimization, keyword research and placement is perhaps the easiest SEO attribute to implement. It is often the low hanging fruit of an SEO campaign. To that end, a few months ago, I wrote about Google Suggest as a quick keyword research tool for situations like SEO copywriting where many pages need to be swiftly optimized. Another free tool to consider, with a few more bells and whistles, is Wordpot.com. 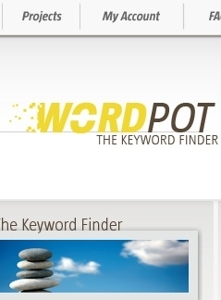 Wordpot.com is a Canadian keyword research tool that came online in 2005. The tool stated its primary focus as being “on finding niche advertising keywords and optimizing Google AdWords.” The company claims 80 million terms in its database, and growing. Results are gathered from multiple search engines (though they don’t name which ones) and are then aggregated to come up with the Wordpot results. This is a common model also use by Wordtracker, KeywordDiscovery and other keyword tools. Wordpot.com claims to collect its data consistently (“24/7,” to quote them), though updates to its search information occur only on a monthly basis. The company plans to increase the frequency of these updates in time. Both Wordtracker and KeywordDiscovery have free versions of their services that are not unlike Wordpot. One of the great advantages of Wordpot, however, is that unlike the free version of KeywordDiscovery (which offers similar information), there is no captcha to get through in order to access the information. While the free Wordtracker doesn’t have the captcha, the information that Wordpot offers is more detailed. There are other cool and useful features, too. Once a query has been made, Wordpot offers both Exact Daily (searches for the exact term) and Total Daily (searches that contain the search term) numbers. To the left of those results are synonyms, related words, and associated words, which are all clickable links if any of them strike your fancy for further research. Though more detailed, “long-tail” phrases often don’t trigger these alternative terms, this is a great feature for research that I’ve not seen any other free tool offer. Hopefully, Wordpot will continue to hone this to include these extended results for more phrases and terms. A monthly graph appears to the right of those results reflecting month-to-month differences in queries for terms. This is handy especially when researching seasonal terms. The small graph links to a larger one-year graph, which is not only handy for seasonal research but also pay-per-click campaigns and other paid advertising. Wordpot also offers free registration that upgrades you to additional bells and whistles, the most important of which is the ability to collect keywords and export them. Once logged in, words can be added to Projects, which are essentially collection folders to collect keywords for a given need. Once a collection is complete, it can then be saved within Wordpot and exported to Excel or a text file at any time. The Project screen also allows for the ability to import a list of keywords, which are then added to a given project (it could be a new project if you like) with results added en masse. This is particularly handy when revisiting an existing list of keywords or repurposing words and phrase form secondary sources. While Wordpot is still not a replacement for full-fledged versions of KeywordDiscovery and Wordtracker, it gives its free counterparts a good run for the money. Wordpot claims to have much more on the horizon, and perhaps that means they will eventually become a pay service, but if they choose to maintain the free model, they could quite possibly dominate the free keyword research market. For the moment, though, consider Wordpot for your basic keyword research needs like large copywriting projects and optimizing secondary pages. For the budget-minded, the tool may even suffice as a primary keyword research device. My hope is that Wordpot will just get better…and stay free.